No other season needs as much preparation as winter. 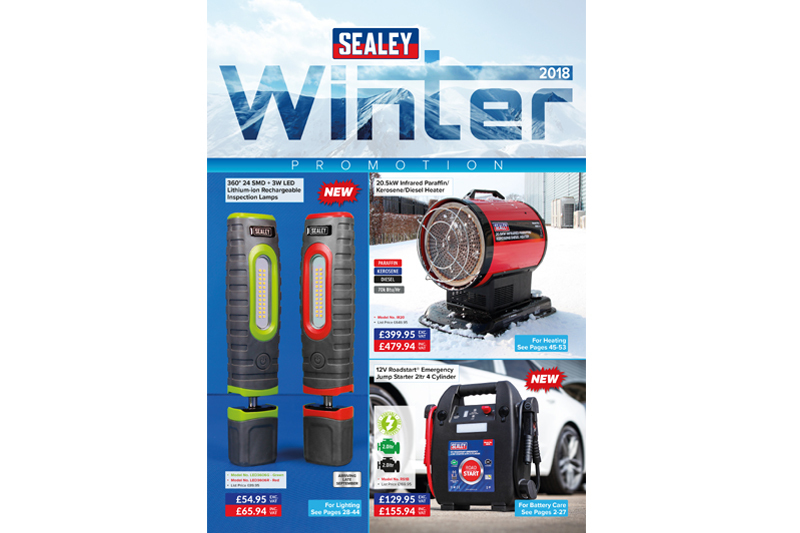 For this reason, Sealey has a host of special offers in its new Winter Promotion, which launched on 1st September 2018 and is valid to 28th February 2019. With up to 59% off list price on over 500 products, you are sure to find some really useful items for the cold, wet and sometimes hazardous conditions which winter brings. With great deals on Vehicle Starters & Chargers, Heaters, Generators, Lighting and Water Pumps, you can also find a wide variety of Vehicle Maintenance & Servicing Equipment. Car Covers, Breakdown Kits and even Snow Shovels and Spreaders are included to make sure you have all you might need, along with Winches, Booster Cables and Consumables to assist in the maintenance and safety of your vehicles. Check out the new top quality range of DEKRA Approved Sealey/Schumacher Roadstart Emergency Jump Starters. They incorporate patented microprocessor controlled speed charging and thermal runaway protection and unlike other booster packs, can be left safely on charge continuously. A fusible output cable provides surge and spike protection which prevents damage to vehicle electronics. Our new LED3606 range of rechargeable Inspection Lamps have 24 super bright SMD LED’s, which provide up to a whopping 1,000 lumens output with a 120° spread of light. They are also packed full of the usual, useful features and incorporate Sealey’s 360° swivel and tilt function. Also on offer are a great range of heating solutions, perfect for any garage or workshop and especially ideal for all those winter projects. Safety Lighting, Tie-Downs and Recovery Winches, which are perfect for any business or well-equipped motorist, can also be found in this ‘not to be missed’ promotion. Copies of the Winter Promotion can be ordered or viewed online at www.sealey.co.uk. Download the free Sealey app for your smart phone or tablet, where all current promotions and the full catalogue can be viewed.